Married women and the nine-metre sari (pronounced with a long a, like saari). My grandmother still wears the nine-metre saari . . . in modern times with less is beautiful being the norm - even a regular saari of 6 metres is considered too much material to wrap around a person! In many states in India it is customary for the bride to wear the 9-metre saari at the time of her marriage! In Maharashtra especially in villages and in certain orthodox and traditional homes one would find the married women only in 9 metres of cloth called Nav-vaari wrapped in an intricate way! My daughter is of the opinion that maybe Nav-vaari was invented to keep woman from being raped – because by the time the woman is unwrapped the man would be caught? In all probability!
. INDIA - season of frost - hermant . Legend has it that when the beauteous Draupadi - wife of the Pandavas, was lost to the Kauravas in a gambling duel, the lecherous victors, intent on humiliating and harassing Draupadi, caught one end of the diaphanous material that draped her demurely, yet seductively. They continued to pull and unravel, but could not reach the end, and thus undrape her. Rama Bharadwajan, 48, a bank employee in Hyderabad, is readying her stock of nine-yard saris for a special puja (prayer) before her daughter's wedding. Tradition demands that each of the six women who will assist her in the puja wear the nine-yard madisar (Tamil word for sari). Grumbling about the discomfort of wrapping the cumbersome yardage around their resistant limbs, the women nevertheless acquiesce, in deference to tradition and succumbing to their belief that things must be done "the right way". The "right way", in most orthodox Tamilian Brahmin (the highest caste) households, dictates that for important ceremonies - like weddings and death anniversaries - the woman of the house must wear the nine-yard sari draped in the complex manner that has been handed down through generations. The man, too, is expected to wear the equally complex panchagatcham - five-pleated dhoti (short sari). 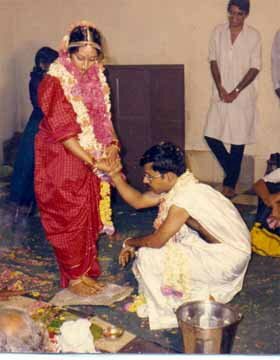 Even today, the Tamil Brahmin bride customarily wears a red koorai - a silk nine-yard sari - that she ties for the first time with the help of her sister-in-law just before the kanya daanam (the ceremony in which her father gives her away in marriage). The madisar is not just a garment or a style. "The madisar has both symbolic and practical meaning," says Seetha Anand, a young educator from Hyderabad, who says she "loves the look of the madisar - when worn well, it is so flattering". The nine yards of the sari function as the all-inclusive garment. It is worn without a petticoat or underskirt - unlike the normal six-yard sari - and, if wrapped properly, requires no other undergarment or upper garment (such as a blouse). "With one of the folds pulled through between the legs (and tucked into the back on the belt), the style fulfils the requirements of modesty and protection," says Anand. The trouser-like style also made it easy to work and move around in. In fact, the tradition of a nine-yard sari was prevalent in many other Indian states like Maharashtra and Karnataka. History even mentions several women soldiers draped in a nine-yard sari going to war. Women like Jhansi's Queen Laxmibai fought enemy troops on horseback, wearing a nine-yard sari. In South India, the nine-yard madisar also symbolizes the unity of the male and female principles of the universe. "The sari has pleats and the pallu (the upper decorative part of the saree), and the lower part looks like a dhoti," says Venkatraman. "This is like the ardhanareeswara (half man and half woman)," she says. However, the sari is not an easy garment to wear. "It's good exercise every morning, because you have to bend, twist around, move your arms every which way...it is a good 10-minute workout!" laughs Venkatraman. The complex manner in which it is tied makes it difficult to learn, and the length of the sari makes it difficult to maintain - both factors that have contributed to the madisar's decline in recent times. Fewer and fewer young people know how to tie the sari without assistance. In fact, you don't see the madisar much these days - not unless you walk the streets of Panagal Park and Mylapore in Chennai, or perhaps in the smaller temple towns of Tamil Nadu.A few enterprising retailers in Chennai have introduced "ready to wear" madisars, complete with stitched pleats, hooks and belt, "mainly to cater to the tradition-conscious NRI market," says one observer. But these have not really taken off, and hardly any of the mainline sari shops carry them. Nalli, one of Chennai's most popular saree shops, once did brisk business in nine-yard saris all year round. "Now, sales are mainly restricted to the marriage season and festivals like Deepavali (festival of lights)," says Jaganmohan, the manager of the Hyderabad branch of Nalli.The nine-yard saris that are popular in the south come mainly from Kancheepuram and Arni, from special looms earmarked for the purpose. "There is some trade in such saris in Maharashtra and Karnataka, but the majority of buyers are still Tamil Brahmins," adds Jaganmohan. "But overall, yes, I suppose we sell fewer nine-yard saris today than we did 10 or 15 years ago. "As Bharadwajan's relatives prepare for the marriage ceremony, most of them will need help wearing the sari today. Most will not be able to pass on the art of wearing it to the next generation... The future of the madisar seems bleak. ironing man . . .
green grass . . .
***** . Dresses, Fashion, Apparel in India .